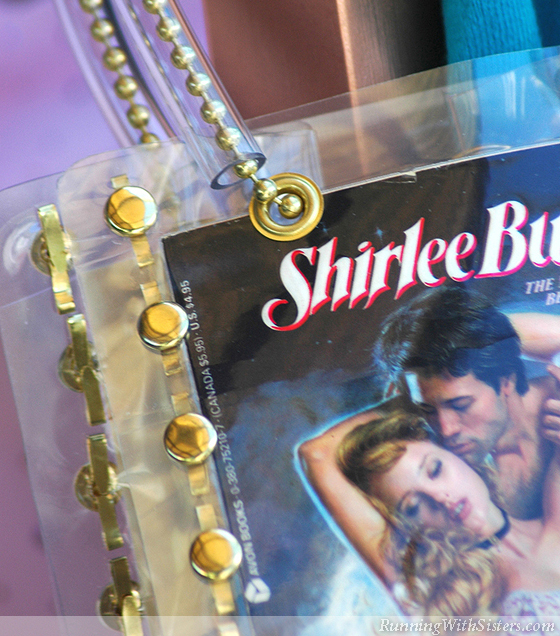 Make a naughty-but-nice romance novel handbag to cherish for all eternity! 1. Carefully remove the front and back covers from the paperback. Trim the torn edges with scissors. 2. Laminate the front and back covers and trim each down to 5.5″ x 8.5″ with the paper cutter. Use the scissors to round the corners. 3. Punch two holes along the top edge of the covers, 1.5″ from the side and .5″ from the top. Using the grommet setter and hammer, grommet each hole. 5. Fold the 3.5″ x 8.5″ vinyl piece in half lengthwise and sandwich it between the laminated covers so the cut edges are aligned and the fold is inside the purse. Push one brad through each of the punched holes and through the vinyl. (If the brads don’t cut through the vinyl easily, use the craft knife to make a small slit in the vinyl.) Fold the ends of the brads back. You will have 9 brads on the front cover and 9 brads on the back cover. 6. Repeat step 5 to attach the 3.5″ x 5.5″ vinyl piece to the bottom and the 3.5″ x 8.5″ vinyl piece to the other side of the purse. 7. To connect the bottom vinyl piece to the side vinyl piece, pinch the open edges together and cut a slit just big enough for a brad at the center .5″ from the edge. Push one brad through the slit and fold the ends back. Repeat for the other side. 8. Feed the ball chain through the plastic tubing to create the purse handles. Attach the handles by feeding the ends of the chain through the grommet holes from the outside and connecting the ends inside the purse using the brass catch. 9. Tuck the organza bag inside the purse as a liner. 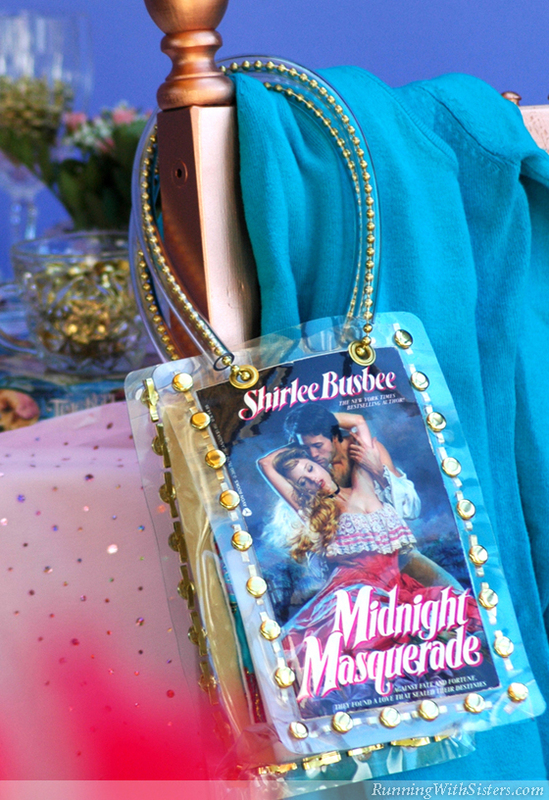 Pennywise Paperbacks: For a steal of a deal on trashy romance novels, seek out the tawdry titles at thrift stores. You can pick them up for a buck apiece!